Beginning with his outpatient horror story, Robert Sealey tells us what can happen when an unsuspecting mental patient trusts an incompetent psychiatrist. Then he contrasts the poor quality of his care with the practice guidelines of psychiatry and observes that its consensus of expert mental health professionals recommends accurate diagnosis and effective treatments using standard of care procedures. After his interviews with 150 depression survivors brought to light coping concerns and common problems, Sealey developed tools for patients, family and caregivers. He offers a mental healthcare compass, practical tips, avoidable traps, checklists, worksheets and even a healthcare planner. The book comes with an annotated bibliography; the extensive reference section has more than 250 entries suitable for laymen. Snapshot reviews, notes and quotes inspire readers to learn about quality mental healthcare. 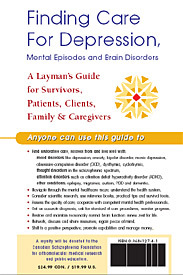 Sealey rates many standard books as well as books written by psychiatric survivors and health professional survivors. Orthomolecular references get four stars (rated restorative). With the health system controlling costs and cutting corners to cope with a difficult economic reality, thousands of patients live with chronic mental illnesses like depression. Patients, family and caregivers are increasingly left to fend for themselves when they could benefit from information and guidance. Sealey explains how patients can monitor their progress, ask for accurate diagnoses and cooperate with effective treatments. If there are problems or a bad outcome, theycan ask for other opinions. We expect a credible layman's guide from a writer whose Bachelor of Science degree included courses in biological and medical sciences and psychology. Still, we wonder what motivated Sealey.How did he find mental healthcare that is consistent with the practice guidelines of psychiatry and applies the life science of biochemistry restoratively for clinical purposes? What did he discover by probing the health system? Why did he decide to help patients find quality care? Robert Sealey, BSc, CA works as an independent consultant in North York, Ontario, Canada. From the age of seventeen, Bob suffered prolonged episodes of depression. Eight health professionals failed to 'cure' him. After decades of misdiagnosis and mistreatment, medical incompetence and short cuts, Sealey wanted to restore his mental health. He kept trusting that it could be done. When a mood disorder 'expert' psychiatrist omitted thirteen standard of care procedures, Bob deteriorated. At the age of forty-six, determined to get well, Bob used his resilience and persistence to set up an Independent Depression Project, explore the mental healthcare maze and write the SEAR series of layman's guides. Finding Care For Depression, Mental Episodes and Brain Disorders is his latest work, a sequel to his Depression Survivor's Kit and Mental Healthcare References. A former fraud investigator, Bob advises local clients about accounting, tax and financial planning. Thirty percent of his clients have depressions, mental episodes or brain disorders. He understands their concerns because his own brain has faults and fallibilities. Bob is variable, volatile and vulnerable to episodes of depression and hypomania. Reactive, intense, hypersensitive, periodically creative and surgingly energized, he is bipolar, migrainous and anxiety-ridden. He has been stable since 1996, using restorative healthcare. I ask readers to consider his account seriously because his illness might have left the patient forever incapacitated and a charge on his family and community. His anecdote represents only one of thousands of stories about similar patients who recovered using orthomolecular treatment. The evidence has been published in many clinical accounts, standard and complementary journals and many books. The evidence is there. It needs only to be studied and applied. Sealey opens the door. Bob encourages patients, family and caregivers to hope, learn, cooperate and benefit. He reminds us that many people have mental disorders. We all know some of these poor souls: silenced, stigmatized, marginalized and shunned as if they were lepers. They suffer with conditions like depression, bipolar disorder, schizophrenia, ADD, autism, OCD, anxiety, migraine, stroke and dementia. If their involuntary symptoms are masked by powerful psychiatric medications, patients may seem better but negative 'side' effects of their prescription drugs may leave them uncomfortable, frustrated and disappointed. Such problems are too often dismissed or ignored. Meanwhile, restorative orthomolecular medicine is available to help them live well. We recognize the urgent need for teaching aids designed for laymen: vulnerable patients, concerned family and informed caregivers. By writing about mental healthcare in a direct and uncompromising manner, Sealey questions psychiatric minimalism. Noting that competent mental healthcare involves more than labelling and drugging sick people, he advocates for accurate diagnoses and effective treatments. His tips, tools, teaching tales and references educate readers about the practice guidelines of psychiatry, standard of care procedures and restorative orthomolecular medicine. 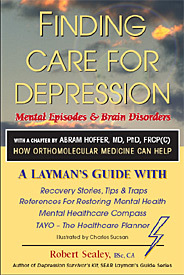 If you or someone you know lives with depression, mental episodes or a brain disorder, this book can help you find effective care. - A. Hoffer, M.D., Ph.D.